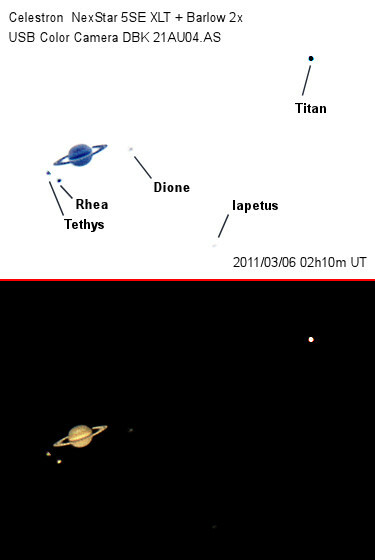 Titan, Tethys, Rhea, Dione, Iapetus are five bright moons of Saturn, the ring planet in our Solar system. They can be observed through amateur telescopes with at least 100mm (4 inches) of aperture. The following picture was taken through a 5 inch telescope, a Celestron NexStar 5 SE XLT. It is an image composed of 84 single subframes of 1 second of exposition each one. It was taken on 2011-03-06 02h10mUT using a DBK 21AU04.AS Imaging Source CCD camera. Planet was recorded in a different exposition through a video stacked (shift and add) using Registax free software. Check out the JPL simulation matching the picture above. This entry was posted on 2011/03/09 at 1:29 am and is filed under Astrophotography with tags Astronomy, Astrophotography, Camera, CCD, Celestron, DBK, Dione, Iapetus, Moons of Saturn, planet, planetary, Registax, Rhea, ring, satellites, Saturn, shift-and-add, solar system, stacking, Tethys. You can follow any responses to this entry through the RSS 2.0 feed. You can leave a response, or trackback from your own site. ahhh wonderful, that’s so nice. Does it look like the “same”= can we see th moon, with the naked eye in a lightbridge 12?